I bought this book out of curiosity about the role of the British consular service in the emerging colonial development of Africa. I had just finished reading Mario Vargas Llosa’s fictionalised account of another British consular official, namely Sir Roger Casement who was consul to Congo Free State port of Boma in the African Congo in 1903. (reviewed here). Sir Roger was feted, is still feted, particularly in Ireland, as a hero, a man, amongst the first to recognise the horrors of colonial exploitation, a friend of the indigenous African, a fearless anti-slaver and a beaming and unique example, particularly in the Consular service, particularly amongst the British, of a concerned and considerate humanitarian, most unlike his other consular colleagues, who are, by implication, mere tools of their Imperial Government’s policies. In the Irish republican context, and indeed in Llosa’s book, this humanitarian insight of Sir Roger is attributable to him only because he is Irish. Had he been an English born consular official, or indeed as Kirk was, a Scott’s born consular official, then the thrust of the argument advanced on behalf of Sir Roger is that there would not have developed, could not have developed, the insightful consular official, the fearless consular official, the friend of the indigenous consular official or the humanitarian consular official. I am an admirer of Sir Roger Casement but often think this view of his role as a consular official is somewhat over egged by the Irish. His investigations and his report on atrocities in the Congo were carried out on his Government’s instructions and insistence. It was the policy of his government to expose the atrocities of the Belgium King Leopold against the native tribes and Sir Roger was the chosen consular official charged with the investigation of the King’s rubber trade. That he carried out his investigation with the utmost dedication and focus and did so in the most arduous and dangerous of conditions are beyond question. It was a magnificent achievement and he well deserved the knighthood which followed. But I suspected that there are probably many other investigations and reports carried out by other consular officials of equal importance and produced in equally difficult, dangerous and arduous conditions, in Africa and elsewhere, and that are now forgotten and unknown and buried in the archives of the foreign office. There is an argument that what separated Sir Roger’s work in the Congo from the work of others, be they consular officials, missionaries or explorers, was his stretched neck. Had they too been hanged for High Treason, then we would probably know a lot more about them. As it is we are invited again and again to view Sir Roger’s work in isolation and with all the emotional context and the weight of martyrdom that is Ireland. Perhaps not the best of motives for picking up Alastair Hazell’s story of the Last Slave Market and the role of the British consular in bringing it to an end. But I am so glad that I did. John Kirk was operating in a slightly earlier period than was Casement. He was consul to Zanzibar from 1873. (Casement was consul to Boma in 1903). Kirk was in place before the great colonial scramble for Africa developed. Casement was there at the height of the colonial scramble. This astonishing book gives a deep insight into those early imperial years, when the East Coast of Africa came under the jurisdiction of the Government of India rather than the Government of Westminster. Much of the interior was unexplored. Indeed Kirk had first encountered Africa as a botanist with Dr. Livingstone on his earliest explorations into the great unknown continent. His initial appointment to the consular service was several years later, as a medical doctor in Zanzibar. There he toiled for almost twenty years before being appointed as the actual British Consul. Twenty years as a mere functionary, with no powers and no substantial role other than the care of the Europeans stationed in that remote corner of the world. Zanzibar was a separate sovereign state, controlled by and owned by the Arabs from Oman. The Sultanate of Zanzibar was, in its early days also the Sultan of Muscat. It became an independent Sultanate in 1856. Its riches and wealth grew from the trade in Ivory and Slaves. From the Sultan’s palace and harem on the Zanzibar seafront he controlled the slave trade for the whole of the middle east, sending raiding parties into the interior to capture slaves, transporting them to Zanzibar where they were fattened up, sold in the Zanzibar slave market and transported, in Arab dhows, on to the Gulf states, to Egypt, to Persia and to Turkey. It was a trade sanctioned by the Koran and carried on for centuries. 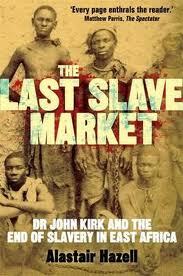 It continued long after the abolition of slavery and its forcible shutdown on the West coast of Africa. There was annoyance and embarrassment in the Westminster Government that this evil trade continued. They were under pressure from the anti – slavery campaigners who were affronted to find that having succeeded in abolishing slavery that it continued, on a massive scale in the Middle East. But by contrast, there was a high degree of indifference in the Indian Government who did not want to interfere in the sovereign rights of states with whom they enjoyed long established treaties and good relationships. And it was India that had jurisdiction. And so it was that the trade continued with the Imperial powers effectively turning a blind eye. The British Consul to Zanzibar was always an Indian man. Appointed by the Indian Government. The East India Company and the Indian Government were indistinguishable. Kirk was not of the Indians. A mere doctor, who applied for a vacancy, he spent his early years in this godforsaken fever ridden posting, gathering botanical samples for Kew and tending to his duties as a medical doctor. But he also set about gathering information upon the slave trade. He got to know the principal traders, noted the volume of slaves passing through the slave market, the categories of slaves, where possible, their origin, their price, the names of the slavers who went into the interior to harvest the slaves, the financers, the customs men, the dhow captains, the slave routes from the interior to Zanzibar and from Zanzibar to the Arabian Gulf, the seasons of slave trading affected as it was, by monsoons and wind currents along the east African coast. In the end this mere functionary knew more about the slave trade than the slavers themselves. Which meant that Her Majesty’s Government, from his reports, knew more about what was going on than any other nation represented by consular staff in Zanzibar, Germany, America, Portugal, Dutch, even the Sultan himself. Kirk saw Consuls come and go. Indian men, appointed by the Indian Government, nominally committed to abolishing the slave trade. He saw bluster, gunships, threats of force, and weak treaties, and yet more bluster. But still the trade continued. When in 1873 he was finally appointed as the British Consul, he found himself, because of his systematic collection of information upon the trade, in a uniquely powerful position. The traders knew him, had known him for over 20 years, as a man without power, a harmless functionary of the consulate staff. He had befriended them and they had disclosed all the secrets of the trade to his meticulous notebooks. Now he set about with grim determination to destroy slavery on the east coast of Africa. He did it by bluff, negotiation, promises, bargains, persuasion. He made slavery, in the eyes of the Arabs, socially unacceptable. He persuaded the Sultan to crush this important source of his wealth and power, to discipline those who continued the trade, to stop the dhows, to close the slave market. And then, when the trade switched to land routes, marching their slave caravans across Africa to the North in order to avoid his energy and determination to wipe it out, he went into the interior, incepting caravans, freeing slaves, fighting slavers, closing down slave staging posts and successfully, almost on his own, defeating and crushing slave trading from the East coast. Not without reason did he become known as the man who ended the East African Slave Trade. He was not hung for High Treason. Songs about him were never written. He was knighted and Sir John Kirk, Scotsman, British Consul to Zanzibar, retired. He lived until 1922 and died peacefully, and forgotten, in his family home in Sevenoaks, Kent. I suspect that in the archives of the Foreign Office amongst the terrible tales of Imperial colonisation, that there are more stories similar to this. Sir Roger Casement’s story is but one of them. Both are heroes.